Chiffon again!!! I hope you all won't get bored with my chiffon adventures here. Yeah, I've finally master it already. I was so happy when my friend tried the chiffon recipe here with a great success. I really happy when she told me her kids enjoyed the cake so much and repeatly asking her to bake chiffon for them. 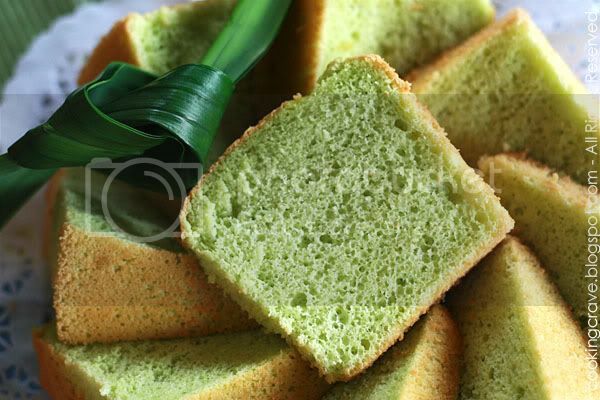 Pandan (Screwpine) Chiffon are one of the most common chiffon we have here. We can always buy this at the bakery or morning market. I don't really like the one they sell out there as I found they use too much of pandan essense or pandan paste. The pandan smells too strong for me and sometimes they are too sweet as well. I use the recipe from Kevin Chai's - Chiffon Cake Is Done and did a few changes to it, I always found his recipe very sweet and need to reduce the sugar used. I use my own way baking it too. 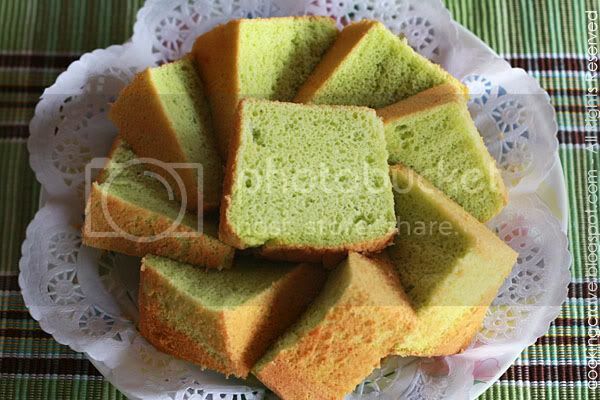 The cake turn out soft and fluffy, very fragrant & very yummy! Do give it a try and tell me what do you think okay?? Chiffon cake are easy once you have master how to beat the egg whites foam. Make sure the egg whites you beat reached stiff peak before we mix it into the egg yolk mixture. ***Always use clean, dry, oil free mixing bowl for beating the egg whites. The egg white must not have any egg yolk in it, not even one drop of egg yolk. This are two important thing you must take note before start beating the whites. Egg yolk batter: Hand whisk egg yolks with sugar till it's a bit dissolved. In coconut milk, add in pandan juice, salt and pandan paste - it's already with green colouring in it. Stir to mix. Pour the coconut mixture into the egg yolks and hand whisk to mix. Add cooking oil and mix well. Fold in flour slowly until it forms batter and no lumps. Set aside. Prepare the egg white foam: In another bowl, beat egg whites till it form soft peak. Gradually add in sugar till it finished. Add in corn flour and continue beating at high speed until frothy and stiff peaks form. Pour batter into ungreased 9" (22cm) chiffon pan. Bake in preheated oven at 170c (I bake at 160c for 30mins) for 30-40mins or until it is cooked. Remove cake from oven, immediately invert cake onto table. Wait until it is completely cooled before unmould it. I love pandan chiffons! I didn't know it was known as screwpine.. very informative.. haha.. Ive been saying that I want to buy a chiffon mould but I haven't had time. Would you suggest me buying the mini ones or the large ones? May I know how you make the pandan paste? Anncoo: Welcome to join the chiffon adventures, I'm looking forward to see your cake.. hehe!! 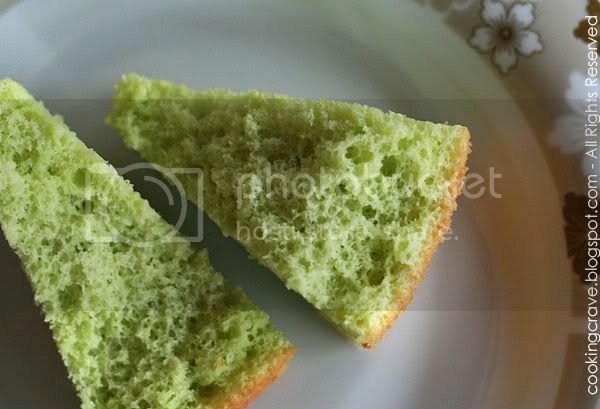 Sonia: You can get the pandan paste from the shop selling baking ingredients or you can use pandan essense but have to add green food colouring to get the nice green colour. my sister has kevin chai's book too & same as you, she finds his recipes are mostly a bit too sweet. otherwise, they're ok. really nice chiffon ..the color is gorgeous too. Thank you for your receipes. I was searching for receipes to substitute cream of tartar. Now I know corn flour can subsitute it.